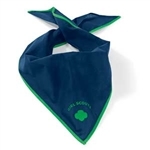 Navy blue triangular, cotton poplin scarf with green border, "Girl Scouts" and trefoil screenprint. This scarf is worn by Cadettes, Seniors, and Ambassadors. It can be knotted or held in place with a scarf slide - click here to view. 39 1/2" x 27" x 27". Imported. A cool throwback style from many moons ago! 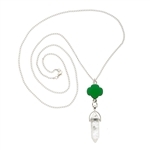 1¼" acrylic crystal pendant is suspended from an approximately ⅝" green epoxy trefoil charm on a 30" silvertone metal chain. Gift-boxed. Iron. Imported.